Access Crystal in your Gmail through our Chrome Extension. Use Crystal for real-time email coaching and predictive personality profiles of email contacts. To do this use the Chrome Extension. 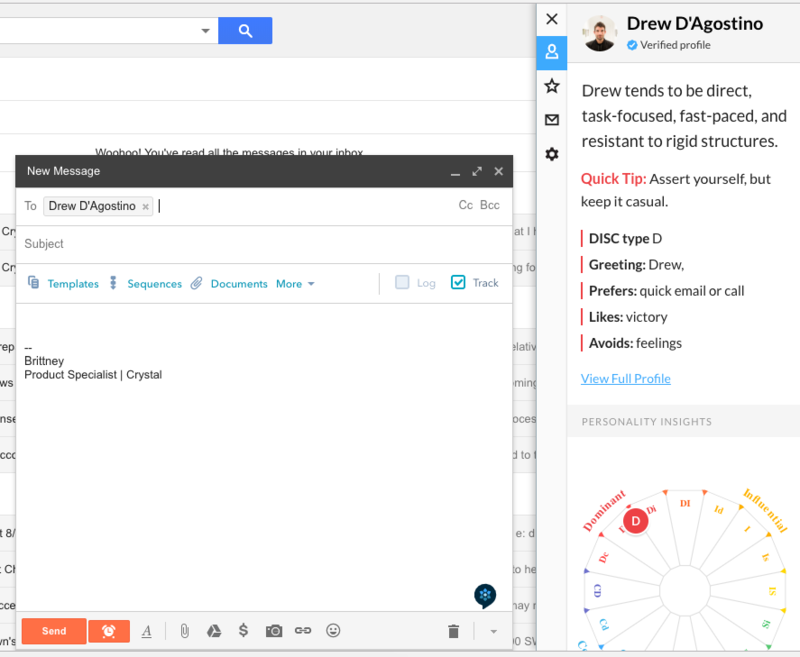 The Chrome extension has two major features inside of Gmail; personality information and email coaching. Select blue Crystal Icon on the bottom right corner of your email. View sidebar containing a brief overview, communication style, key motivations, and work style of your recipient. Select Email Coach to access to tips and suggestions on every aspect of an email based on your recipient's personality. Start composing the email to view in-text corrections. Hover over any blue underlined words that appear while writing. View Crystal’s suggestions on how to edit your email based on the recipient’s personality. An example would be If the person you are emailing is a Di, Crystal will suggest being more informal with your greeting.